Growing up, I loved Dr. Seuss books. Hop On Pop was one of the first books I could read by myself. Green Eggs And Ham was one of the first books I memorized. I regularly gift Oh! The Places You’ll Go! for graduation gifts. 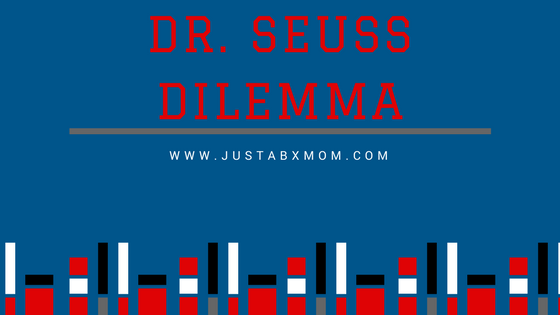 I have recently been introduced to some ideas on the acclaimed Dr. Seuss that make me question my loyalty. I have spent much of the morning researching people’s thoughts and ideas around Dr. Seuss and racism. There, I dropped the R bomb. As a Woman of color raising a Woman of Color racism is something I have to think about daily. That might surprise you. Or it might it not because you might feel forced to think about racism daily as well. Last September a librarian from Cambridge, Massachusetts rejected a gift of ten Dr. Seuss books from First Lady, Melania Trump. The response from the librarian was beautiful. She explained how she appreciated the First Lady’s generosity however it would not be a gift she could accept in good conscience. She expressed this view very articulately and if you have the chance I suggest checking it out. In doing some reading on the topic the best thing I found was an article that I will paraphrase thoughts from. The article stated that we cannot judge Dr. Seuess stories by our current system of moral understanding and beliefs but should look at what people believed when it was written. I know nothing about Dr. Seuss’ personal life. I do have many happy memories of reading his stories as a child. What I take from that is that reading is what gives me those memories. His books were perfect for a new reader. I bet most of us grew up reading his stories as they have been being published since the 1930s. I think that as parents we have a responsibility to our children. We must teach them about themselves and others. We must introduce them to books because books can lead them to places their feet might not. Every time a child opens a book they go on an adventure. Make sure that adventure is diverse. As a Parent of Color I know that #RepresentationMatters. I have shared that with you all on this blog and through my social media. If a school only has Dr. Seuss books in their libraries then all students will not be represented. That is fact. If Dr. Seuss is the book you buy because you don’t know of other options then please reach out to me for suggestions because there are many authors that children will love that do include inclusive worlds in their stories. Will I be burning the Dr. Seuss books in our home library? Never. When given the choice to buy a new Dr, Seuss book I will think of what are the subtle and overt messages in the book, and if those are what I want my child receiving. And I will commit to continuing to diversify our home library and bringing all of you diverse works of literature in my reading round-ups. It was an eyeopener for me as well. Happy to share!